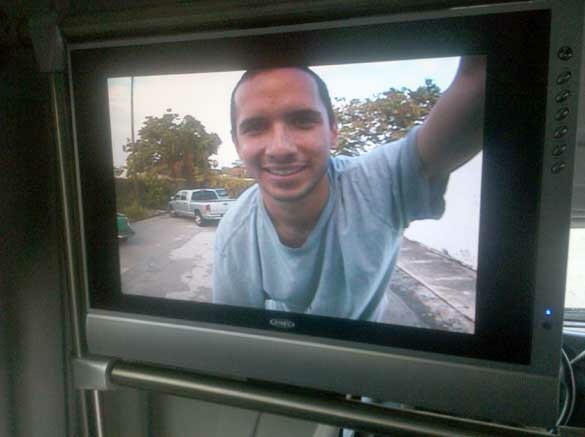 It’s an exciting day at Miami Tour Company - we installed front view cameras on our tour buses. This means, when you’re on the Miami bus tour, driving down the road, you can see a full panoramic view of what’s coming up ahead, in front of the bus. To ensure everyone has a good seat, we added five monitors inside the cabin, and placed the camera high, on top of the bus, about 15-feet off the ground. We have learned, for passengers to feel relaxed, it’s important for them to be aware of the surroundings… this is why we made a free souviner map of the tour route. People want to know where they are going. Adding a forward-facing video camera on the bus just made sense. With the camera being mounted so high off the ground, watching the monitors makes you feel like you’re literally flying down the road. Here is a short video of the tour, driving past Miami Beach City Hall, showing the monitors inside the bus. Thanks to our engineer, Frank Galetti, the installation was easy. Frank used a high resolution surveillance camera, with a special wide angle lens that works great. He also added a video amplifier so the signal is crystal clear on each of the monitors. If you need an electronics expert for a special project, I highly recommended contacting Frank Galletti. You can reach Frank by calling (786) 566-7462. 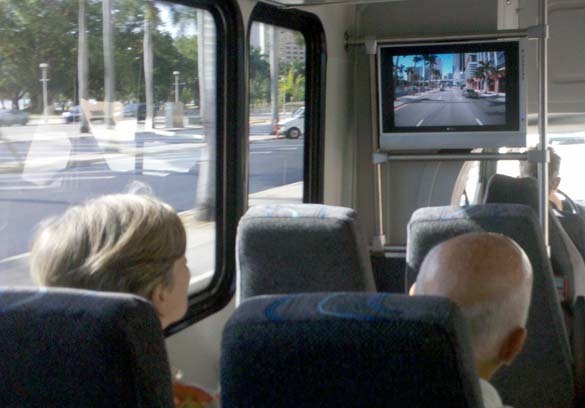 Miami Tour Company is the first tour bus operator in the world to combine this type of audio and video technology with a sightseeing tour - come experience it yourself. There is nothing we love more than showing you around. Miami Tour Company is TripAdvisor’s #1 Miami attraction, specializing in fully guided, small group tours of Miami, Key West, Orlando and the Everglades. Blogger and media inquires: to arrange a free Miami bus tour, contact Gus Moore at (305) 754-2206. "Miami Bus Tours: Now With Front View Cameras"
This is amazing! I can’t wait to take a test drive! ...what are you waiting for?? Bill, no kidding, watching the video screens feels like you’re flying over the road. Thanks for the awesome review of the tour. COOL! So now mama and papa can go on vacation, “see” a city, never leave the comfort of their air conditioned bus, and not even have to turn to look out the freakin’ window! It’s all on tee-vee! Why not let ‘em just sit at home in their family room in Peoria, send ‘em a DVD of “Miami Scenes,” and save ‘em the trouble of leaving the La-Z-boy recliner & box o’ Pop Tarts? Hi, Stretch, welcome to Miami Beach 411. Sorry if I confused you… I was never suggesting our customers watch the TV’s through the entire tour. We added TV’s on the bus to give passengers more control over their surroundings, with the ability to see what’s coming up ahead. We also make at least 5 stops during the 4-hour tour, where passengers can get off the bus and explore the different areas. I visited your website - cool photos. I bet you could get some awesome shots during the tour. Want to come check us out? Having recently been on the bus this weekend, the tv screens are a great new feature. It’s nice to be able to see what it ahead as you are driving along.